Stereoisomerism is the difference in spatial arrangement of molecules having the same connectivity of atoms. These molecules have the same chemical formula and molecular formula, but different geometries. These stereoisomers can be categorized into several categories considering the similarities between these molecules. Cis-trans isomers are one such type of isomers that can be found in alkanes and more specifically in alkenes. Cis-trans isomerism can be found when the position of a side group is changed while the rest of the molecules are identical to each other. 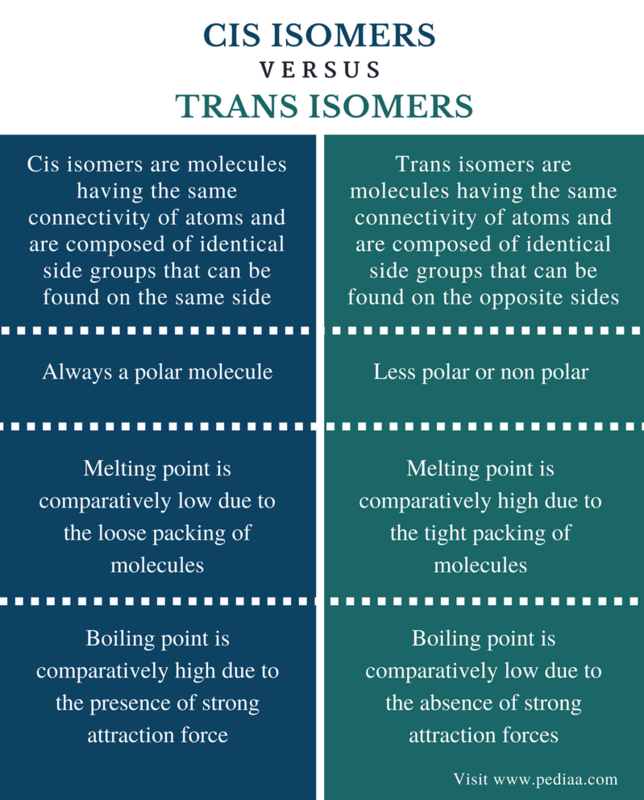 The main difference between cis and trans isomers is that cis isomers are essentially polar whereas trans isomers are comparatively nonpolar. Cis isomers are molecules having the same connectivity of atoms and are composed of identical side groups that can be found on the same side. For example, in alkenes, there is at least one carbon-carbon double bond present. If there are identical groups that are attached to the two carbon atoms but are located on the same side of the molecule, then they are called cis isomers. In order to have cis isomerism, a molecule should have two identical side groups and two different side groups. The two identical side groups should be attached to the two vinylic carbon atoms (carbon atoms that are in a double bond). 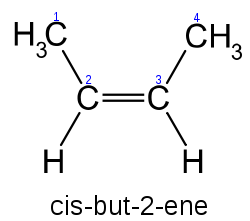 As shown in the above image, 2-butene has cis-trans isomerism. Here, the cis isomer is composed of two methyl groups attached to each vinyl carbon atom. These two methyl groups are on the same side of the molecule. Identical groups being on the same side affects the polarity of that molecule. If there were more electronegative side groups on the same side, there is a very high polarity in that molecule. Therefore that molecule becomes a highly polar molecule. Due to this increased polarity, there are strong attraction forces between these molecules. This results in a higher boiling point since strong attraction forces reduce the ability of molecules to leave each other. But the melting point is comparatively lower since cis isomer are not tightly packed due to the repulsion forces between molecules. 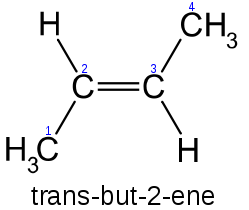 Trans isomers are molecules having the same connectivity of atoms and are composed of identical side groups that can be found on the opposite sides. Here, the identical side groups are located in a cross pattern. A molecule should have two identical side groups and two different side groups in order to have trans isomerism. The two identical side groups are attached to two vinyl carbon atoms, but these groups are located in opposite directions. As shown in the above image, trans isomer has the two methyl groups on opposite sides. The two methyl groups are not attached to the same carbon atom. Therefore, this is a good example for trans isomerism. Trans isomers are often nonpolar molecules. But there can be some degree of polarity according to the type of side groups present. However, there are no strong attraction forces between trans molecules due to the less/no polarity. Therefore, the boiling point of trans isomer is comparatively low. Cis Isomers: Cis isomers are molecules having the same connectivity of atoms and are composed of identical side groups that can be found on the same side. Trans Isomers: Trans isomers are molecules having the same connectivity of atoms and are composed of identical side groups that can be found on the opposite sides. Cis Isomers: The cis isomer is always a polar molecule. Trans Isomers: The trans isomer is less polar or nonpolar. Cis Isomers: The melting point of cis isomer is comparatively low due to the loose packing of molecules. Trans Isomers: The melting point of trans isomer is comparatively high due to the tight packing of molecules. Cis Isomers: The boiling point of cis isomer is comparatively high due to the presence of strong attraction forces. Trans Isomers: The boiling point of trans isomer is comparatively low due to the absence of strong attraction forces. Cis-trans isomerism describes the difference between molecules having the same connectivity of atoms but different properties. These different properties are caused due to the difference in the spatial arrangement of the two molecules. The main difference between cis and trans isomers is that cis isomers are essentially polar whereas trans isomers are comparatively nonpolar. 1. “Wired Chemist.” Geometric and Optical Isomers, Available here. Accessed 6 Sept. 2017. 2. “Cis & Trans Isomers of Alkanes.” Chemistry LibreTexts, Libretexts, 21 July 2016, Available here. Accessed 6 Sept. 2017.